I happened to get black sour cherries, also known as morello cherries, which seem to be less commonly grown in the Northeast than the pinkish-red sour cherry variety (also known as amarelle). 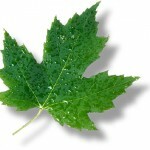 This is the black cherry that we know of from “black cherry”-flavored things. A pie, tart, crumble, cobbler or other baked good are very fine ways to use them. But I wanted to taste them in all their intensity, sans pastry, this time. Cherries are expensive; even when they’re in season, a pint of this fresh, summer delicacy will set you back a good sum. That’s because cherries need to be carefully picked (cherry-picked, you could say) from the tree once just ripe. It’s a labor-intensive task that requires acres of mature orchards (you can’t just plant cherries in your backyard like strawberries, see). But it doesn’t have to feel like work. 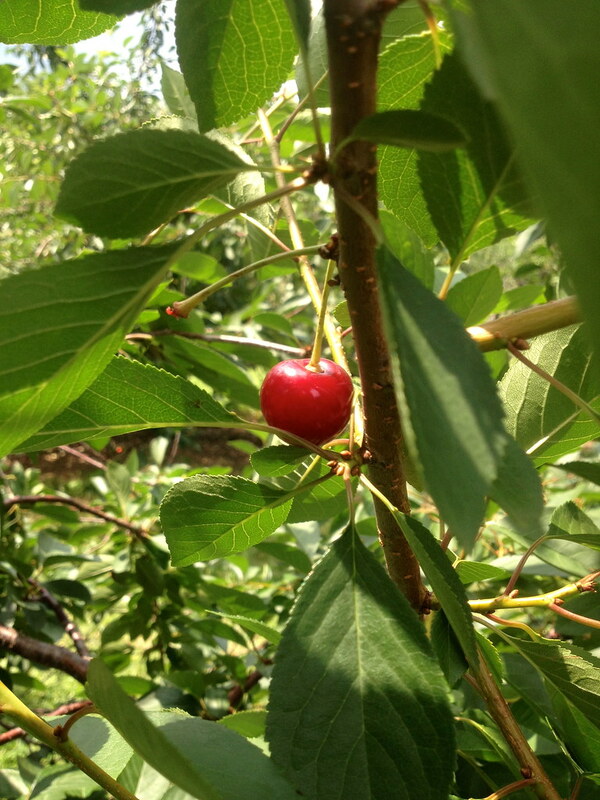 You can do the farmers and yourself a favor by going cherry-picking at a U-pick farm for fun. Last weekend, I took a jaunt Upstate to pick cherries at Fix Bros. Farm, one of the only farms in the area to grow black sour cherries. From early morning on, hoards of locals as well as people from afar came to fill buckets of the prized cherries, so that when my friends and I arrived, in early afternoon, the trees were down to the last few. When we were done picking, the farmhands were already turning would-be pickers away. It may have been slim pickings, but my two pounds of cherries were plenty for me. These also cost just $4, after about half an hour’s worth of picking. That’s not a lot in anyone’s estimation, and there was no entry cost or rental fee for the bucket at the farm. Er, check it out next year? And get there early, if you can. I could have pickled or brandied these cherries, turned them into syrup or cordial, or, of course, a tangy pie. But I went a comparably simpler route–that is, if you have an ice cream maker of some sort. I turned them into sorbet. I’m so glad I did now, because every time I reach into the freezer, I can get a burst of that weekend’s sour-cherry bliss. Plus, it’s pretty hot out, and anything cool calms my senses (the blast from opening the freezer notwithstanding). I didn’t do anything unexpected with this sorbet recipe, except for drizzle in a bit of maple syrup when it tasted a little more tart than sweet upon further inspection. Once the cherries were just barely cooked and pulsed with a food processor, it was chilled thoroughly before going into the ice cream maker for a churn (at which point I added the maple syrup). I think this gave the ultra-tart flavor a bit of roundness to balance. And it also seemed kind of backcountry-appropriate an ingredient to add, instead of more sugar (try a squeeze of honey instead of maple syrup, too). Whatever it was, it highlighted the weekend’s cherry-picking excursion all the better, and stays there frozen in time, until I finish the pint. Note: I do not own a cherry-pitting tool, but a paring knife works fine for slicing them open and removing the pits, if you don’t mind a red splatter or two on your wall (or 40). Pit the cherries and combine them with the sugar and water in a saucepan. Bring just to a boil, then reduce heat to a simmer and stir occasionally for 5-6 minutes, uncovered. Let cool completely. 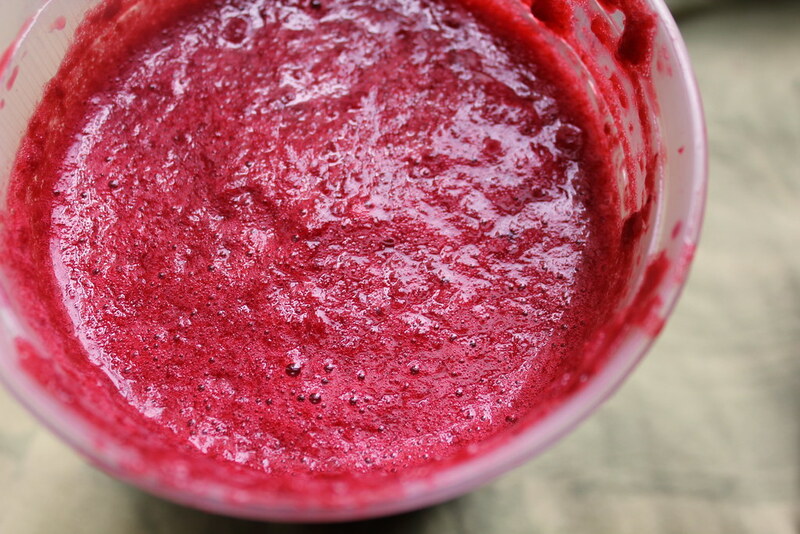 Transfer to a blender or food processor and pulse until smooth, about 2 minutes. Stir in the maple syrup. Cover and refrigerate until completely chilled, at least 4 hours. Transfer to an ice cream maker and follow the machine’s instructions to churn into sorbet. Transfer to an airtight container and freeze at least 1 hour to set before serving. Store in the freezer for up to 2 months. 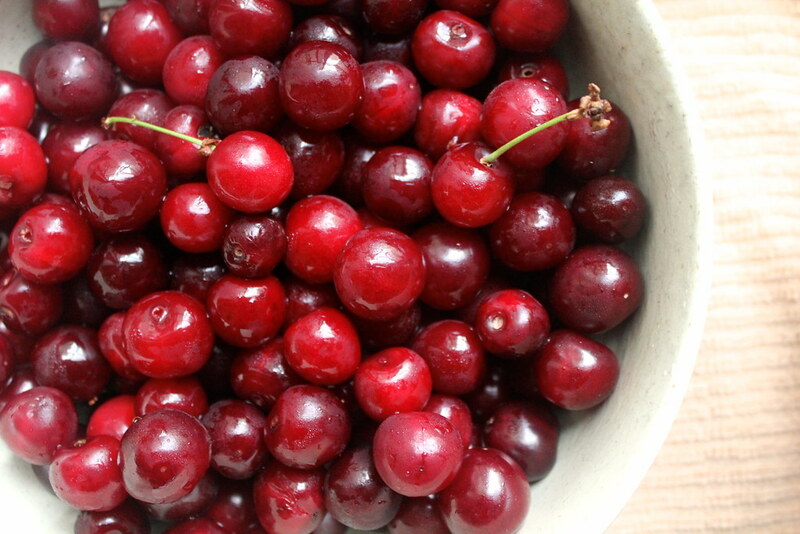 Five brownies: Sour cherries are high in vitamins and minerals such as Vitamin A, C, and fiber. But they’ve also been known for their medicinal uses, particularly to help treat insomnia, which recent studies have also concluded. 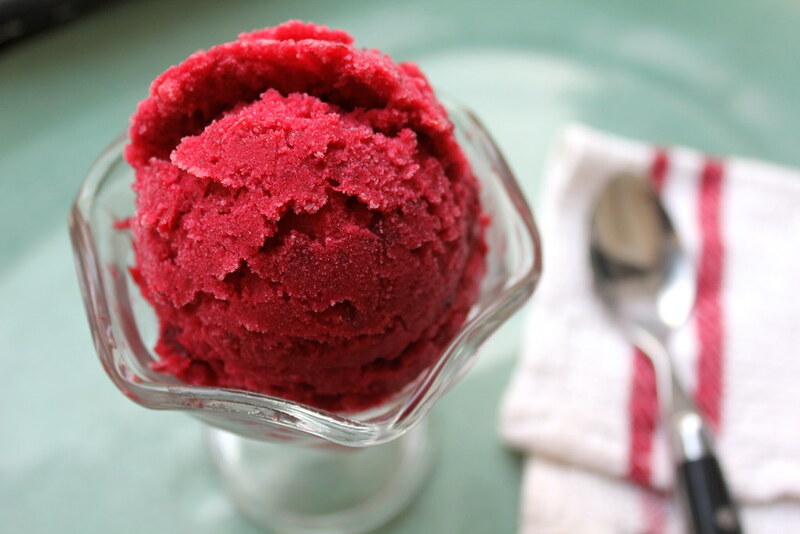 While lower in calories than sweet cherries naturally, this sorbet recipe has added sugars to put some of that back, but I tried to keep them minimal, at least compared to most frozen desserts. Eight brownie points: Cherries have a short-lived season in the Northeast, so if you can get out to a local farm (or the local farmers’ market), get a bunch to freeze and use them for the coming months. Cherries are just about all that’s in this recipe, unlike many store-bought sorbets with additives and preservatives–except for a couple pantry staples of sugar and local maple syrup. I’m a fan of your blog and want to say I love the objective form to write your texts. Cherry desserts are always a delight.